captin nod: Oh noes! The press! It certainly looks like the papercraft work has taken a life of its own, and word of it has moved out of the blog domain and reached real publications (*gasp*)! There's an article about the papercraft (and me!) 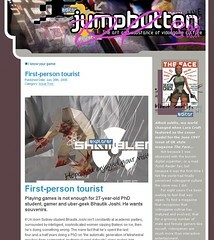 on the excellent, Melbourne-based online Jumpbutton magazine. just wanted to let you know that i laugh in the face of meat ball. follow the bear or perish sweater monkey!